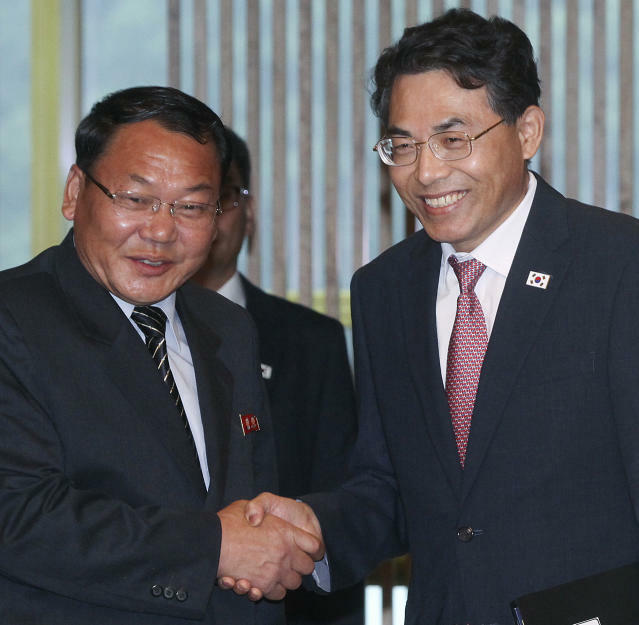 SEOUL, South Korea (AP) -- The rival Koreas have agreed to jointly study ways to improve North Korea's outdated railways and link them with the South, as they continued to take conciliatory steps amid global efforts to resolve the standoff over the North's nuclear weapons. North Korea's state media on Wednesday acknowledged inter-Korean discussions on "issues arising in reconnecting, updating and using the railways on the east and west coasts," but did not describe that South Korea would be sending officials and experts to examine the country's aging rail system. The agreement Tuesday to start joint inspections of North Korea's railways on July 24 was apparently as far as the rivals could go at the moment. The vows to upgrade the North's railways and roads will remain purely aspirational until international sanctions against North Korea are lifted and the South is freed to take material steps. The talks at the border village of Panmunjom were the latest to discuss ways to carry out peace commitments made by North Korean leader Kim Jong Un and South Korean President Moon Jae-in. During their April 27 summit, when they issued a vague commitment to denuclearize the Korean Peninsula, Kim and Moon expressed a desire to modernize North Korea's railways and roads and reconnect them with the South. The Koreas are to hold another meeting on Thursday to discuss roads. South Korean officials say better transport would greatly improve North Korea's economy by facilitating trade and tourism. It may also provide the South with cheaper ways to move goods in and out of China and Russia. However, some experts say updating North Korean trains, which creak slowly along rails that were first laid in the early 20th century, would require a massive effort that could take decades and tens of billions of dollars. It might be impossible to embark on such projects unless North Korea denuclearizes, which isn't a sure thing. In their summit, Kim and Moon called for "practical steps" toward the "connection and modernization" of railways and roads between South Korea's capital, Seoul, and North Korea's Sinuiju, a port town on its border with China, and also along the peninsula's "eastern transportation corridor." During the meeting on April 27, Kim went against the grain of North Korean propaganda by describing the country's transport conditions as poor and praising South Korea's bullet train system, clearly communicating an eagerness to improve his country's rail networks, according to comments provided by South Korea's presidential office. In Tuesday's meeting, the Koreas agreed to start inspections of the North Korean portion of a railway that once connected Seoul and Sinuiju before moving on to railways in the eastern region. Japan completed a 499-kilometer (310-mile) railway line connecting Seoul and Sinuiju in 1906, mainly to move soldiers and military supplies, before it annexed the peninsula in 1910. The Gyeongui line was separated in 1945 at the end of World War II, when the peninsula was liberated from Japanese colonial rule but also divided between a U.S.-controlled southern side and a Soviet-controlled north. The peninsula remains in a technical state of war after the 1950-53 Korean War ended in an armistice, not a peace treaty. The Gyeongui line was temporarily reconnected during a previous era of rapprochement between the rivals in the 2000s. The Koreas in December 2007 began freight services between South Korea's Munsan Station in Paju and North Korea's Pongdong Station, which is near the border town of Kaesong. The South used the trains to move construction materials northbound, while clothing and shoes manufactured from a factory park jointly operated by the Koreas in Kaesong were sent southbound. Japan during its colonial rule completed a 193-kilometer (120-mile) rail line between North Korea's Anbyon county and South Korea's Yangyang along the peninsula's eastern coast in 1937. The Koreas temporarily reconnected the cross-border part of the line between 2007 and 2008 to move South Korean tourists in and out of the North's scenic Diamond Mountain resort. However, the project never advanced beyond a trial run before South Korea pulled out in June 2008 amid worsening ties. South Korea has ambitions to significantly extend the eastern "Donghae" line so that it connects its southernmost port of Busan with North Korea's northernmost industrial cities of Chongjin and Rajin. Seoul hopes the line will eventually link South Korea with Russia and the trans-Siberian railway. South Korea also hopes to eventually reopen a railway between Seoul and North Korea's eastern coastal town of Wonsan which ran through the middle of the peninsula.